Here is another way in you can enable the management traffic type on a VMkernel interface in ESXi without having to resort to using the vSphere API, this especially useful when automating a kickstart installation. 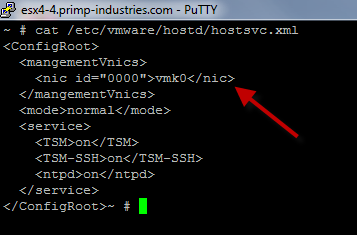 When you enable a specific vmkX interface (esxcfg-vmknic -l) to allow for the management traffic type, there is an entry that is made in the /etc/vmware/hostd/hostsvc.xml file. The specific interface is denoted by a unique nic id which starts off at 0000 and is incremented by one for additional VMkernel interfaces that are added. For the changes to take effect, you will need to restart hostd agent by running /etc/init.d/hostd restart. You will also need refresh the network sub-system by using vim-cmd hostsvc/net/refresh which will refresh the vSphere Client view else you will have to do it manually before you can see the update. If you would like to integrate this into your ESXi kickstart, you can easily do so based on the number of VMkernel interfaces you will be creating during the installation. You can add the following into your %post section which uses a here document to overwrite the existing hostsvc.xml with the expected VMkernel interfaces that should have the management traffic type enabled. How to restart the ESXi management network via command-line? With ESXi 5 I took a slightly different approach. I do have sleep commands in between each line, I’m sure it’s overkill but I was just trying to rule out any variables. On the contrary to what MacFaden stated above, in my findings if I did the hostsvc refresh before restarting hostd then the copied file would revert back to normal. Granted my approach was a little different than the one blogged here but I’m sure the behavior has to be similar. Now time for the burning question… why isn’t a simple task like enabling management traffic a esxcli or vim-cmd command? i know this post is old, but i just wanted to add that it actually is possible via esxcli.